Whoever said comfort food and a nourishing meal had to be mutually exclusive?! This dish checks both of those boxes. It’s made with only 6 ingredients and will have you feeling like an accomplished chef in no time (takes less than 30 minutes to make). Polenta is made from cornmeal so it is naturally gluten-free (similar to grits, but a little coarser in texter) and contains 3g protein and 3g fiber per cup. Traditionally butter and cheese are added to a polenta dish for extra flavor. However, I subbed ghee for butter and nutritional yeast for the cheese to give it a rich flavor without the lactose. Ghee is clarified butter (making it lactose free) and makes it a lot easier on the tummy for some people. Nutritional yeast is a dairy-free cheese substitue, which is very popular in the vegan world thanks to its cheesy and nutty flavor. Plus nutritional yeast is a a great source of vitamin B12 (a nutrient often lacking in plant-based diets). Lastly, as always I recommend pairing this meal with your favorite veggies (as with all other meals! #veggiesallday) for an added nutrient and fiber boost! 2. Melt 1 Tablespoon of Ghee in small saucepan over medium heat and add polenta and 1/4 cup water. Continue to stir until polenta is softened for ~10 minutes. Add in 1 tablespoon nutritional yeast and stir. 3. Meanwhile, heat up cast iron skillet with 1 Tablespoon olive oil and saute scallops for 2-3 minutes on each side. 4. 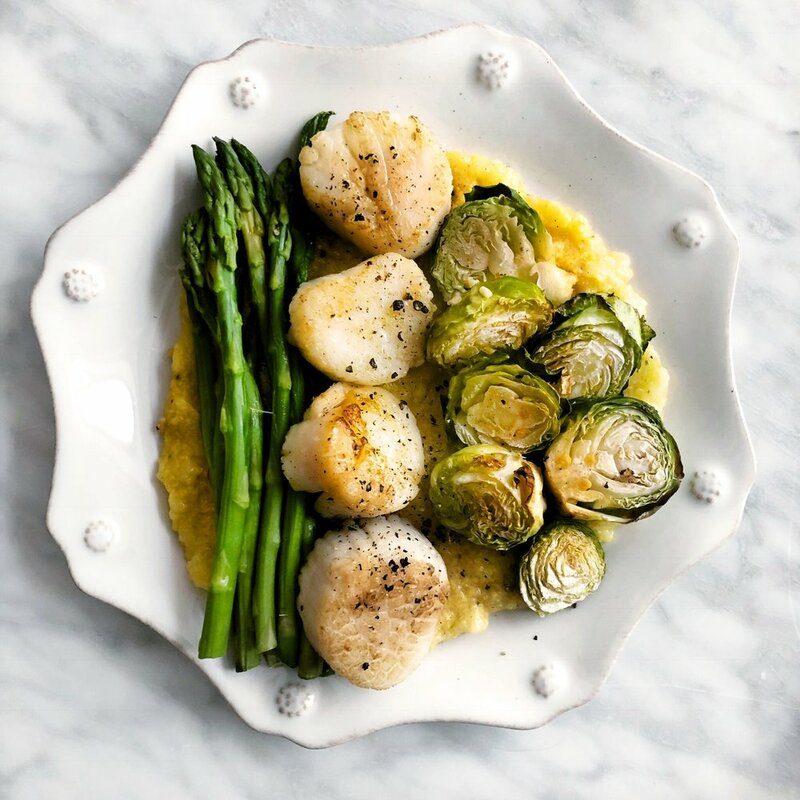 Serve scallops over polenta with 1-2 servings of veggies (pictured: steamed asparagus and roasted brussel sprouts in olive oil).